British conservation specialists from the Courtauld Institute in London have removed centuries of soot, grease, grime and graffiti from Hellenistic-style paintings on the wall of a cave in the canyon of Siq al-Barid in Beidha, about 3 miles away from the main city of Petra. They’re at least 2,000 years old and may have been painted earlier. Very few examples of Hellenistic painting have survived, and what’s left is mainly fragments. We have very little Nabatean art at all, so finding such extensive pieces with intact color and detail under the layers of filth is remarkable. At the instigation of the Petra National Trust (PNT), conservation experts Stephen Rickerby and Lisa Shekede restored the paintings to life. The work took three years, and was completed only last week. “The paintings were a real mess,” Rickerby said. He described what has emerged from the blackened layers as “really exceptional and staggeringly beautiful, with an artistic and technical quality that’s quite unlike anything else”. Three different vines, grape, ivy and bindweed – all associated with Dionysus, the ancient Greek god of wine – have been identified, while the birds include a demoiselle crane and a Palestine sunbird with luscious colours. The scenes are populated by putti-like figures, one winged child playing a flute while seated in a vine-scroll, others picking fruit and fighting off birds pecking at the grapes. The paintings are exceptional in their sophistication, extensive palette and luxurious materials, including gold leaf. Petra, in what is now Jordan, was the epicenter of an immense trade network linking East and West. 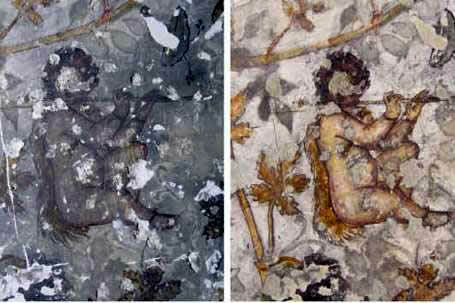 As traders in everything from Indian spices to Levant aromatics, Nabatean culture was influenced by its trading partners, hence the Hellenstic style of these paintings which decorate the dining room, main chamber and a smaller recess of what appears to have been a rock-carved spa for the elite. The Nabateans were experts in water control; a marked advantage, you can imagine, in the middle of a desert. Nabateans took advantage of the canyon flash flooding, channeling it with a system of dams and conduits, creating an artificial oasis that would last for hundreds of years until an earthquake in the 4th century A.D.